Elise: Exige S Prem. Pack S/W. Evora: silver alloys + chrome badges (aka The GTE look!!). Something new from Lotus in Shanghai? It's got a roof scoop too . Recent interview with JMG (after departing from Lotus) suggested that the next genuinely new Lotus will replace both Evora and Exige, but this doesn't look genuinely new (unless there are some very cleverly machined bits of Evora shaped polystyrene under that cover..... there's some clever kit in the Design Studio!!). Hmmm, interesting. Note the headline photo of the Donato Coco designed Elan - funny eh? Not even the mock-up Esprit 😄! Which elise to go for? You might be able to find an Elise SC for that sort of money. Had mine for three years and loved it to bits. You get the rev happy 2ZZ, but with the additional shove of a neatly integrated supercharger. Never had any heat-soak probs either. Also owned a 1.6 S3 for less than a year 'cause it was crap - one to avoid like the plague! My current Elise S (now known as 220 Sport) is a joyous little thing though. It's deceptively quick, loves to be revved out, and has the added bonus of very decent mid-range torque, thanks to the switch to the 2ZR (mit supercharger :-) ). It's just huge fun to drive - anywhere - love it!! Have you considered Reverie? They make superb carbon seats at various price points (ahem - none of which are particularly cheap), but this is one their finest motorsport seats for the Elise (and all Elise derivatives)... Reverie XC Carbon Ha - cancel this one - just seen your latest post! Anyone know here I can obtain new Pirelli P-Zero Corsa LSs for the rear of my Evora? 275 / 30 x 20. Lovely tyres but quite a soft compound. Alternative is an all-round replacement with Michelin Pilot Sport 4Ss, which seems a bit of a shame 'cause the front Pirellis have loads of life left in them yet. Steve will travel just about anywhere to get your business. Both of mine were in Poole in Dorset! Arrived in the post today, and is another superb job - huge thanks to everyone. Plus............ (), having my gorgeous Elise on the cover does make 2019 a very, very good year indeed . Evora would be favourite. If you can find a lightly used 410 then that would be the one to go for. 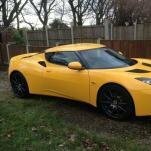 Failing that, a low mileage Evora SR or Evora S SR (which have gorgeous, high spec. Recaros). Avoid the ugly 400 though. Had mine serviced by Lotus Silverstone since new. However, I was lucky enough to catch the Lotus 333 offer when I bought the car from Westover down in Poole, so the first three annual services were free. Would recommend Lotus Silverstone every time though - professional, courteous and very friendly. By the way, you'll love the Evora!! And, like Phil's, mine is also an N/A Sports Racer, and this really is the sweet spot in the Evora range (imho), despite the apparent power deficit of "only" 276 bhp. But, throttle response is instant, there's enough torque to make easy, super quick progress anywhere, and the sound of that V6 will give you goosebumps - guaranteed. Just remember to hit the Sport button every journey (which also provides better throttle response, and a higher red line)! !